We all know that marijuana contains the cannabinoid THC or delta 9- tetrahydrocannabinol, having been told that is what gets you high and experiencing its wondrous effects. We as growers cultivate cannabis for the purpose of getting the high it creates when consumed and usually have the desire to obtain strains with the highest THC content possible. With all of the knowledge people are gaining from testing the marijuana plant we now know that cannabis has around 85 cannabinoids, so the general public only being familiar with one of them seems crazy. In today’s world with the cannabis culture growing rapidly, ground breaking scientific tests are beginning to be done all over the world and we are learning that there is much more to be discovered within the contents of this magical plant. One of the biggest discoveries found with modern research was with the second most concentrated cannabinoid - Cannabidiol, abbreviated CBD. THC and CBD are the two most abundant naturally occurring cannabinoids with THC accounting for 12-25% and CBD for >1-4% on average. CBD is like a brother or sister to THC, because like all siblings sometimes you work symbiotically together and sometimes you’re combating or off setting one another. Unlike Cannabidiol, THC is a psychoactive compound (meaning it affects brain function by acting on the central nervous system, which can result in altering your mood, behavior, perception and cognition) and its effects are what users of cannabis feel the most when smoked. The high is responsible for the feeling of relaxation, the heightening of your senses and of course the inevitable snacking you shall do when it gives you a craving for the munchies. It also has medicinal uses for a multitude of symptoms including; mild to moderate pain, insomnia, depression, nausea and appetite loss, just to name a few. For some people though THC may cause anxiety or paranoia, often related to the feeling of time slowing down, which it of course is not. #1 If only a quarter of what researchers are saying about CBD is true it can potentially have as large an impact on modern medicine as the discovery of antibiotics. The CBD is considered a non-psychoactive cannabinoid, although it may seem to have some psychoactive effects, it emits a high that is sedative and responsible for the relief most people look for medicinally. Its medicinal uses surpass those of any other cannabinoid we know of, including; reducing or preventing inflammation and nausea, diabetes, alcoholism, PTSD, schizophrenia, rheumatoid arthritis, epilepsy, cardiovascular disease, anti-psychotic, anti-anxiety and even as a pain killer against muscle spasms or neuropathic pain, which are traditionally harder to treat with any medicine, even pharmaceutically. While both the THC and CBD cannabinoids individually have many beneficial properties when they are used together, as they come from the marijuana plant, their effects are far more impressive. When working alongside of the THC molecules CBD can negate some of the anxiety that THC causes as well as give relief for different types of pain than THC can. This makes nature the best doctor by combining them into a single plant because they are way more effective when administered together, especially for people with multiple symptoms. CBD appears to also antagonize the excitatory effects of THC by delaying the onset of the high, while also making it last as much as twice as long. Some of us refer to that as ‘creeper’ bud when the effect doesn’t seem to be there after consumption, but then all of a sudden…BOOM…it comes out of nowhere slamming you like a ton of bricks. Although marijuana does affects some people different than others, it likely you have experienced these antagonized effects. Mammals, birds, reptiles and fish all have endocannabinoid compounds made by their bodies which are basically a “natural” produced THC called anandamide. Technically, anandamide (Ananda = bliss in Sanskrit + amide = chemical type) is a naturally occurring neurotransmitting compound that our bodies have circulating within them. Both THC and anandamide act thru cannabinoid receptors located on cells throughout our bodies and have similar effects on things such as; pain, appetite and memory. Receptors are merely gate keeper proteins embedded in cells that direct chemical signals from outside molecules into the cell, telling them to do something, kind of like an air traffic controller for our cells, but this communication only happens after a molecule or compound binds to them. A molecule that binds to a receptor is called a ligand and the receptors are very specific when it comes to what can bind to it and only certain compounds will bind to each type of receptor. It’s like a lock and key, only certain keys open specific doors and when the door is open you have a gateway, and in the case of receptors it’s a gateway for a directional signal. One single cell can have many different types of receptors attached to it that are made to communicate with different compounds. Cannabinoids only affect us because our bodies contain these receptors that are made to bind to specific cannabinoid molecules. Human brains actually contain more cannabinoid receptors than any other G-protein coupled receptor! Our cells containing so many of these that bind specifically with the THC on top of the fact that our bodies produce their own form of “natural THC” (anandamide) however tiny the concentration, makes a lot of sense out of the fact that humans are so drawn to this plant. There is nothing unnatural about the utilization process our bodies go through with cannabinoids and marijuana is proving itself to be a very effective natural medicine and it should be available for use to patients who need it. So far there are only two known cannabinoid receptors in our body that bind with THC; the CB1 receptors which are found in the brain and central nervous system, and the CB2 receptors that are distributed throughout the body, but mostly in the immune system. Other than the cannabinoids found in cannabis (which are of course the most powerful) and the ones our body naturally produces there are many other substances that minutely affect our internal endocannabinoid system, such as; Echinacea, turmeric, black pepper, cacao etc. These and few other consumables have also been found to bind with these same cannabinoid receptors. THC and CBN are known for “fit” like lock and key into nework of existing receptors. The Endocannabinoid System exists to receive cannabinoids produced inside the body called “Anadnamide” and “2-Arachidonylgycerol”. Stimulating the ECS with plant-based cannabinoids restores balance and helps maintain symptoms. CB1 is found mostly in the brain and are concentrated in the brain and central nervous system, but also sparely populates other parts of the human body. CB2 receptors are mostly found in the peripheral organs especially cells associated with the immune system. CBD does not directly "fit" CB1 or CB2 receptors, but it has powerful indirect effects still being studied. Cannabidiol or CBD however, does not have much binding affinity to either of the two known cannabinoid receptors. It instead has a suppressive effect on the enzyme FAAH (or ‘fatty acid amide hydroxylase’) which is the enzyme responsible for breaking down and destroying anandamide. 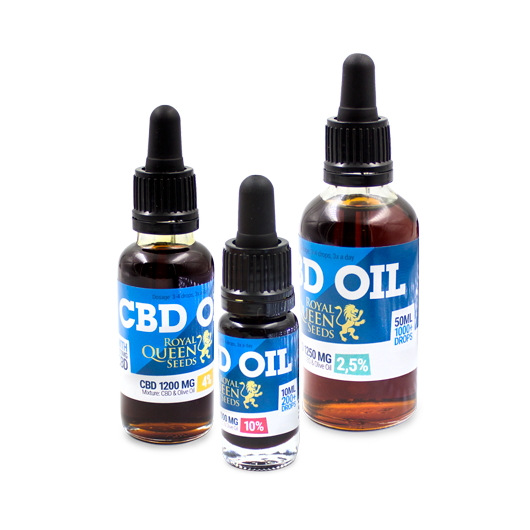 This suppressive reaction with CBD means that more anandamide will stay in your system and for longer periods of time. Anandamide favors the CB1 receptor, as does THC, therefore leaving fewer openings for the action of the THC binding to those receptors and in turn less of an effect. While CBD doesn’t care to bind with CB1 or CB2 it has been shown to interact with other receptors to enable its medicinal effects. There are a couple G-protein receptors located in the central and peripheral nervous systems that interact with CBD. Then there is the TRPV-1(technical abbreviation for ‘transient receptor potential cation channel subfamily V’) that reacts to it. The TRPV-1 receptor which also is activated by capsaicin, the ‘hot’ compound found in chili peppers, is known to mediate pain perception, inflammation and body temperature, as you have probably felt some of these effects from eating a very hot pepper. A big roll is played in anxiety within our bodies by the family of 5-HT receptors, which are activated by the neurotransmitter serotonin. These receptors trigger responses via chemical messages that are either excitatory or inhibitory depending on the chemical context of the bind. The 5-HT1A serotonin receptor is member of that receptor family that binds to CBD and when activated by it exerts the cannabinoids heavy anti-depressant effects, which then trickles down into some of the other medicinal functions CBD gives because this receptor also works in a wide array of processes including anxiety, addiction, appetite, sleep, pain perception, nausea, vomiting etc. It does this by activating an inhibitory response, slowing down its signaling, compared to other drugs like LSD, mushrooms and hallucinogens alike that activate a different 5-HT receptor producing an excitatory response. CBD emits some of its anti-anxiety effects by activating receptors called adenosine receptors. These regulate cardiovascular functions, myocardial oxygen consumption and coronary blood flow, opening up many of the symptoms of anxiety; tenseness, tightness in the chest, shortness of breath etc. These receptors are significant regulators in the brain for other neurotransmitters like dopamine and glutamate. Dopamine is not only responsible for inducing pleasurable feelings but can affect sleep, mood, memory, attention and voluntary movement. Other drugs such as cocaine and methamphetamine act by amplifying the effects of dopamine receptors as well but on a way larger scale. While THC temporarily enhances dopamine levels CBD does not, it has only been found to be sporadic in research done on mice and rats mostly working as an inhibitor. More research is needed into why this is and how it only happens randomly. Maybe it’s related to one of the other 83 cannabinoids we know so little about. 3# The remaining 83 cannabinoids make up only tiny fractions of the plant. Both CBD and THC individually have been proven to work against cancer, but they have synergy when combined. We are in need of enhanced clinical trials to pinpoint exactly what functions they have when they are working together in the form of cannabis. Due to the unfortunate fact that cannabis cultivation and use is still restricted or forbidden in most parts of the world today, leads to the lack of funding and resources needed from governments and agencies to do such research. While there have been some university and collegiate studies done across the globe that compile enough compelling evidence pointing to a possible lead on the cannabis/cancer relationship, it is not definitive as of yet. This possible lead involves another G-protein coupled receptor called the GPR55, sometimes referred to as the orphan receptor because it hasn’t been scientifically placed into a family of receptors although many researchers believe it to be a third cannabinoid receptor. The GPR55’s are mainly found throughout the brain, with a concentration in and around the cerebellum and it is utilized regulating bone density and blood pressure. One example is when you have an overactive GPR55 receptor its signaling is increased and can be linked to osteoporosis. The receptor promotes osteoclast cell behavior, and osteoclast is responsible for bone reabsorption, a process in which bone calcium is broken down and transferred from the bone to the blood, rendering it weaker. This receptor when activated also aids in the rapid growth (proliferation) of cancer cells and has been linked to many different types of cancer. CBD has been shown in some studies to block GPR55 signaling, thereby decreasing both cancer cell proliferation as well as bone reabsorption and exerting its anti-cancer effects. Most tests for illegal cannabis are tests for THC and in most countries CBD by itself is completely LEGAL and you can purchase it in many forms by itself. Unfortunately it will not have all of the same effects it would if it was in the combinations found in cannabis but it can work medicinal wonders even on its own. University studies have proved that it has tremendous effects on mice reducing rheumatoid arthritis inflammation by 50% and even reducing the infarct (necrosis) size by 65% when taken immediately after a heart attack. The high felt from CBD rich plants (or edibles) is generally felt more in the body, whereas THC high effects are felt more so in the head but these can vary depending on the CBD:THC ratios. The differences can be somewhat easily distinguished when comparing the feeling of smoking cannabis to eating an edible cannabis treat. This is because of several reasons; one being that there is more CBD found in the leaves of the plant than in the buds and most of us save the buds to smoke and use the leaf trim to bake with, two because when heated THC begins to burn off at 150-157 degrees Celsius while its counterpart cannabinoid CBD holds a threshold of 160-180 degrees required to begin to burn off. I don’t know about you but I don’t know of many brownie recipes that bake at less than 150 degrees and unless you are privy to the knowledge of adjusting the baking times and temps you are most likely eating treats filled with CBD. The stems also contain more CBD than the buds do making it worthwhile to utilize the whole plant. Contrary to what some people believe a plant cannot be made into a CBD rich plant if it lacks the genetic make up to do so. 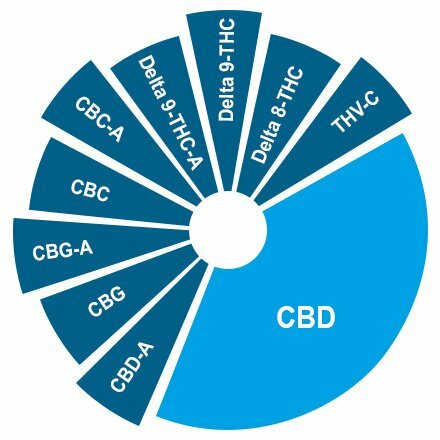 The ratios of THC, CBD and all other cannabinoids are genetically pre-determined. The fact that there are very few high CBD producing plants is a bummer (a high percentage means anything over just 4%) this is a direct result of years of cross breeding plants for a high THC content. There are only 25-30% of the seed stock available today that have the potential to be CBD rich strains (i.e. >4%). When those potential strains create batch of seeds, that batch will then produce several different phenotypes of seedlings, creating both CBD rich and THC rich plants in each generation. On average one out of every four seeds derived from a CBD rich cannabis plant will create a CBD rich phenotype seedling. Even on the rarest of occasions you may get a two out of every four scenario, leaving you with a 25-50% CBD dominate seedlings possibility. The only easy way to proliferate a CBD rich strain is to find one of those dominant phenotypes and grow it into a mother plant to cut clones from, all of the clones will contain the exact CBD:THC ratio as the mother or donor plant. How do you even know if you have a CBD rich strain? There are chemical compound tests that can be done on vegetative plants to identify seedlings that have CBD rich characteristics. These tests allow breeders insight into the CBD:THC ratios without having to wait until harvest time to test the flowers/buds. When you have harvested bud sample you want to test for cannabinoid percentage there are basically two testing methods to employ; quantitative or qualitative. The difference between these two testing methods can be familiarized by comparing the two to quality vs. quantity. you can even get at home test kits now. The methods growers have used in the past trying to achieve their plants top CBD potential are not proven to work and can tend to have a teeter totter effect decreasing the amount of THC in your plants as it transforms into another type of tetrahydrocannabinol called CBN. The one method I’ve found a lot of growers talking about is to let your plants over-flower, by this I mean let them go past their normal harvesting time, letting the trichromes become fully amber everywhere you can see with a microscope. While letting your plants go into extended flowering times is thought to increase CBD production there is no research to back up this claim and each day you go past the milky trichrome stage you are also losing THC as it degrades or oxidizes into CBN. The probable answer looms that it could just be the ageing or change of THC into CBN that may leave you feeling more of the CBD effects without actually increasing anything. Or that CBN will leave you feeling more groggy and sleepy than THC does. The THC to CBN transformation also happens during the drying process to some extent, decreasing the amount of THC as the buds age. My research has only revealed a few well known CBD rich strains, they are rare and said to have >4-15% Cannabidiol; Royal Highness, Euphoria, Painkiller XL & Medical Mass. But as the knowledge about what Cannabidiol does spreads, the need and want for cannabis as a medicine will grow immensely and that’s when breeders will really jump on making more. But if you’re the grower to take what we have learned and select the right parent strains, cross breed those for phenotype selection and get a mother plant to support a brand new strain with the highest CBD content ever, you may even become the literal Doctor Green thumb to our growing culture.